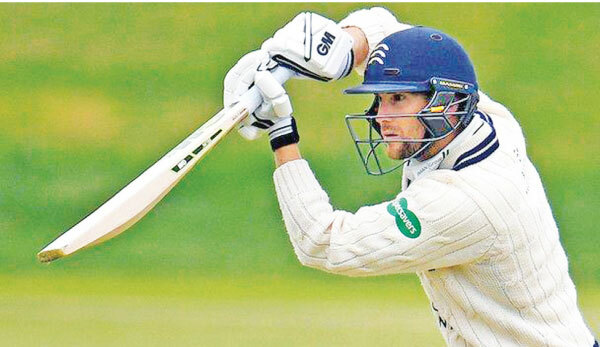 Dawid Malan led a Middlesex recovery with an unbeaten half century. LONDON, Sunday - Hampshire put themselves on course for a big innings victory against Essex after Fidel Edwards ripped through the visitors’ first innings. Edwards took 5-51 as Essex were dismissed for just 164 in reply to Hampshire’s declaration of 525-8. Only an Alastair Cook half-century and Ravi Bopara’s unbeaten 37 offered any resistance for the 2017 champions. Bopara moved to an unbeaten 60 in the follow-on but Essex slumped to 132-4, still 229 runs behind with a day left. Hampshire will only need another five wickets for victory as Essex are without wicketkeeper Adam Wheater who injured his thumb on the first day and will miss at least six weeks following surgery. Joe Clarke moved to the brink of his second century of the match as Nottinghamshire built a commanding lead against Yorkshire at Trent Bridge. Clarke (97 not out) built on good work by Ben Duckett (61) and Chris Nash (75) as the hosts finished the day 446 runs ahead. Steve Mullaney (52) also scored a half-century in a total of 329-5. Earlier spinner Samit Patel took three wickets - including England Test captain Joe Root for 73 - as Yorkshire slumped from 206-5 to 291 all out. Kent gave themselves a good chance of marking their Division One return with a win on a seesaw day at Taunton. They were restricted to a 38-run first-innings lead, mustering only 209 all out after resuming on 84-2. Lewis Gregory (3-26) and Craig Overton (3-46) bowled superbly, but the Kent attack proved just as effective. Marcus Trescothick and James Hildreth went cheaply and Mitch Claydon took 3-30 before Somerset recovered to 171-7 at stumps, 133 runs ahead. Dawid Malan led a Middlesex rearguard with an unbeaten 55 after his side were forced to follow-on against Northants. Malan and Sam Robson (40 not out) added 99 for the third wicket before bad light ended the third day early with the visitors still trailing by 65 runs. Nathan Buck’s 5-54 earlier helped Northants bowl Middlesex out for 271 after James Harris (61 not out) and Steven Finn (34) had frustrated them. Buck claimed two more to reduce Middlesex to 10-2 in their follow-on. Durham closed day three on 10-0, chasing a daunting target of 361 to beat Derbyshire at the County Ground. Tom Lace scored a career-best 61 and Matt Critchley made 51 as Derbyshire built an imposing lead. Harvey Hosein (62) also chipped in with a half-century - his second of the match - before the hosts were bowled out for 334 in their second innings. Durham openers Tom Lees and Gareth Harte survived the final 14.2 overs of the day before bad light stopped play. Leicestershire closed a rain-affected day three on 99-1 and look favourites to chase down 230 to win at Sussex. After Ateeq Javid had been trapped lbw by David Wiese, Paul Horton (53*) and Hasan Azad (27*) built an unbroken second-wicket partnership of 72 to put the visitors on course for victory. Rain prevented the players from taking the field after tea. Earlier, Tom Taylor took 4-75 and Colin Ackermann claimed 5-69 as Sussex were all out for 308.